Two posts, two Tigers hurlers, and comparing this to the Don Mossi posted below, you can see a few subtle differences. Mossi is listed as “Detroit Tigers – P”, and Fox as “Det. Tigers – Pitcher”. On the back, the baseball in the upper corner with the number inside it is now bigger on Fox’s, the number itself is also larger, and “TOPPS” has been added above it. The difference in the “Detroit Tigers/Det. Tigers” text is duplicated on the back, as well. 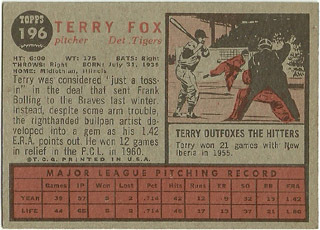 Terry Fox debuted in September of 1960 with the Braves, getting into 5 games as the season wound down, and was then part of a 4-player package Milwaukee sent to Detroit for 2B Frank Bolling (the back of this card claims he was “considered just a toss-in” in that deal). 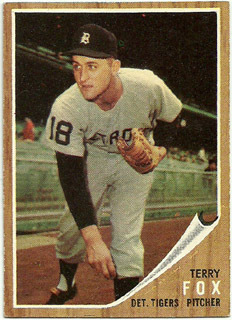 He immediately settled in as the Tigers’ ace reliever (“closer” just doesn’t sound appropriate for the era) putting up a combined 1.56 ERA with 28 saves between 1961 and ’62. That ERA did rise a bit over the next 3 seasons, but never topped 3.59, and he led the team in saves again in ’63 and ’65. In May, 1966, Detroit sold Fox to the Phillies, and one rough season there (4.47 ERA, 1.669 WHIP) marked the last time he’d appear in an MLB game. He spent 1967 with San Diego, the Phils’ AAA club in the PCL, but the decline continued (5.23 ERA in 43 IP), and his career was over at age 31. He compiled a career record of 29-19, a 2.99 ERA, and 59 saves. The backs of both his 1962 and 1965 cards mention arm troubles, so that may explain why it all seemed to fall apart for him beginning in 1966. February 8th, 1962: “Peppermint Twist” by Joey Dee & the Starliters is the #1 song in the land.